Melinda Taylor is an international criminal and human rights lawyer, and a member of Julian Assange’s legal team. 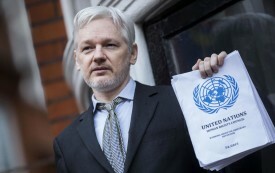 It’s Been Two Weeks Since a UN Panel Declared That Julian Assange Should Be Freed. Why Is He Still Detained? It's time to end Julian Assange’s arbitrary detention at the hands of Sweden and the United Kingdom.